However, this tradition goes back much further than recent times, in essence the tradition is about a bluestone circle being uprooted from Preseli and taken in antiquity to Stonehenge, then reassembled as part of the monument that has stood on Salisbury Plain for at least five millenia, mute, magnificent and yet, above all, mysterious. And despite centuries of attention from all manner of specialisms, the purpose of Stonehenge still remains unclear. This monument’s many secrets and its extant bluestone circle still tantalize and taunt those who attempt to understand the history and purpose of this unique monument. Unexpectedly, one might think, professional archaeologists are presently taking this tradition seriously, as if it were a prehistoric fact, and are combing the Preseli Hills in an attempt to discover the original location of this alleged bluestone circle. Why would they do that? The archaeologists are the latest activity that feeds the bluestone tradition, adding to it more stepping stones across the wide river that separates Stonehenge fact from Stonehenge fiction. As for many other traditions, their recent activity is neither new nor is it unexpected. This mythic territory and this sacred landscape have both been visited before. 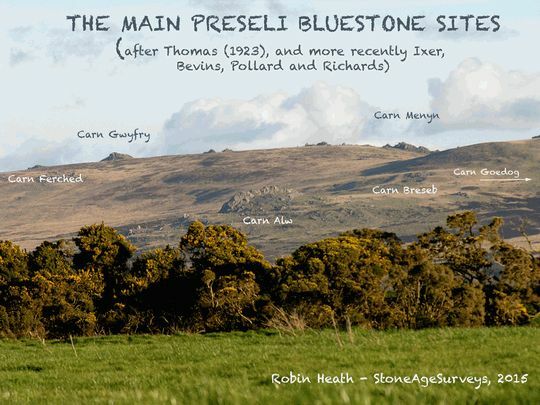 But there are several good reasons why the Preseli hills have become the hot spot for this bluestone circle treasure hunt, the most important being that this landscape’s connection with Stonehenge has been greatly reinforced during the past century. Professor Judd did not link the source of the bluestone circle as being in the Preseli region. In 1903, that source was not known for sure, and nobody then could be certain where the ‘distant locality’ of that original bluestone circle might have been. This remains essentially true today, although within two decades of Judd’s work, much stronger evidence was produced to support why the bluestone circle at Stonehenge might have once been located in the Preseli Hills, even where it might most likely be found. In 1923, a bright light was shone on what had previously been a rather nebulous tradition. 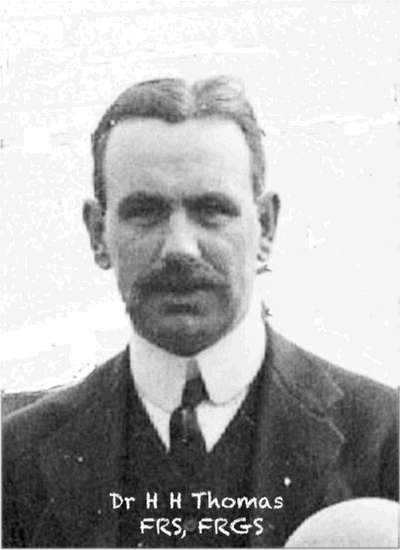 Another renowned geologist Dr Hubert Thomas wrote the first scientific paper that supported a connection between the Preselis and Stonehenge. Thomas undertook a petrological analysis of the bluestones found at Stonehenge, enabling a crucial breakthrough to be made. The evidence suggested that these bluestones had almost all originated from a small collection of outcrops along the main ridge of the Preseli Hills, most notably the outcrops around Carn Menyn, a mile or so from Foel Drygarn, at the eastern end of the main Preseli ridge. If there had ever been a bluestone circle installed in the Preselis, as the tradition suggested, Thomas provided good evidence to back up that possibility, and indirectly identified its location. His work forged a geological link between the Preselis and Stonehenge and although Thomas’s work had not directly mentioned the location of any bluestone circle, his paper undoubtedly was suggesting that were there ever such a monument, it would likely have been located near to Carn Menyn. In other words, Thomas had confirmed scientifically that an original lost bluestone circle could certainly be a possibility, and indirectly had suggested where it might best be found. Thomas’s work represented a major breakthrough in understanding the origins and purpose of Stonehenge. 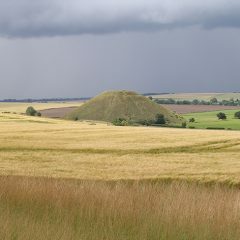 It carved through many of the Dark Age and medieval elaborations of the original tradition, but it left untouched another story, linked to the 6th century Merlin, who told that the bluestones arrived at Stonehenge from the Wicklow hills in Ireland, by giants, and had been shipped over the sea on rafts, by giants who assembled them into Stonehenge. This variant of the original tradition was made very popular by the twelfth century chronicler, Geoffrey of Monmouth. 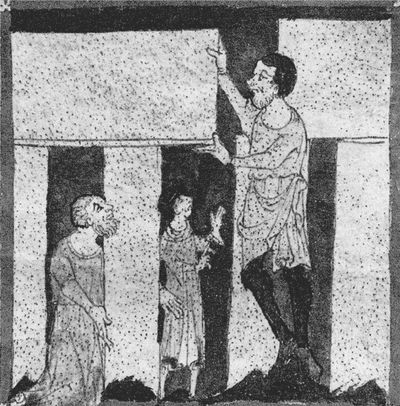 His popular fourteenth century romance was later embellished, this famous artwork showing a giant placing a lintel onto a waiting megalith in order to complete the sarsen circle at Stonehenge. Unfortunately, the geology is all to pieces here, for these are sarsen stones being depicted in this cartoon illustration from the period, not bluestones from Ireland or from anywhere else. The bluestones at Stonehenge are all much smaller than the incredulous mortals shown here watching the giant’s superhuman (and mechanically impossible) feat. However Geoffrey of Monmouth’s story does at least involve a sea journey during the transport of the stones. Allegedly born in Carmarthen, an old Roman sea-fort less than 15 miles from the Preseli Hills, Merlin was brought up in that part of Wales two centuries after it had become an Irish colony, within a large part of southern and western Wales that spoke Irish. Whoever created this story, perhaps it was the late fifth-sixth century wizard, Merlin, who may have thought west Wales was Ireland! This all becomes rather irrelevant however, simply because this tall story is not referring to the bluestones, but instead to the much larger sarsen stones, else Merlin’s giants would have come over as wimps and his story unlikely to impress anyone, for the average bluestone is a tenth of the size and weight of the mighty sarsen stones found at Stonehenge. Then as now, most people visit Stonehenge to see the sarsen circle and the trilithon horseshoe, the central part of the monument. It has been the logo for Stonehenge for a very long time. There is also the not insignificant factor that no one can be certain whether Merlin actually existed or was simply a legendary folk hero. The Merlin story thus fails to convince as a credible explanation of the source of the bluestones at Stonehenge. However the narrative does link Stonehenge to a source of megalithic stones to the north-west of the monument and suggests they were transported by ‘giants’ rather than glaciers, and that the journey involved a sea passage. Geoffrey’s yarn is part of Stonehenge’s history, but it’s foggy message is confusing and gets us very little nearer the source of the tradition of a bluestone circle being moved to Stonehenge. During the 1970s an apparently new Preseli tradition concerning an ancient circle in the Preselis was placed into popular consciousness. This was a claim made by a group calling itself by the acronym IGR (Institute for Geomantic Research) for the existence of an ancient Preseli landscape zodiac. Just as was the case for the bluestone circle tradition, the idea of a prehistoric British landscape zodiac was anything but new, the concept permeating through the works of Taliesin and other great Bards. Welsh history does not go back much further than Taliesin. The two component words that make up Caer Sidi, have a duplex meaning in Welsh, they refer to both the celestial zodiac and to temples consecrated to the ancient British gods. These two words are worthy of a better understanding. In Spurrell’s Welsh-English Dictionary of 1850, Caer is listed as meaning a wall, fortress, castle, fort, citadel, city. The milky way is cited as being Caer Gwydion, often known as Arianrhod. The root sid- is clearly connected with spinning, weaving, rotation or wheels, and the list of words using this prefix is long. Sidell – fly-wheel; winder; whirl; whorl; rim of a wheel. Sidelliad – revolution; rotation. Sidellu – to whirl; to revolve; to rotate. Siddelydd – winder. Sidydd – zodiac. Sidyll – whirl; twirl; whorl; rim. From this Welsh term to describe the celestial zodiac comes an important realisation. Any ancient British monumental circular structure is implicitly going to be a representation or reflection of the sky above, a celestial clock-face, a year-circle and a temple, a manifestation of As Above, so Below, as expressed in one of the tenets of the Emerald Tablet of Hermes, which may date from the seventh century, of similar age to the period of Taliesin. While it may be impossible to prove the veracity of that hoary tradition concerning the existence of a circle of bluestones once erected in the Preselis having been taken to Stonehenge, we can be a lot more confident that this circle, rim or wheel, had it ever existed, would have been understood by its builders to have represented a temple, and would have mirrored the zodiac or celestial sphere in some way. To settle the matter would require that two things can be identified. Firstly, the site of the original (bluestone) circle must be located, a tall order, to put it mildly. Why? Because it would require that archaeologists find a stone circle somewhere in the Preselis where there are probably no longer any stones in situ, else it would have been identified a long time ago. By now it would be presumed to be solely defined by hidden but disturbed earth and in-fill debris where once there had been stones with socket holes. It would be like finding an empty packet of needles in a well-rotted haystack! If and when located, their second task would be to understand the way that the zodiacal rim or circumference of this structure, the year-circle, was divided up. This cannot be undertaken by conventional archaeologists for they are not trained in, and do not have the required skills in recognising astronomical, geometrical or metrological patterns at prehistoric sites. And then there is the small matter that, for over a century, they have been trained to minimise the significance of prehistoric archaeoastronomy as a matter of course. To mention the father of modern archaeoastronomy, Alexander Thom, is to professionally fall on one’s megalithic rod (btw, that’s two and a half megalithic yards or 6.8 feet). So this second task, to understand the sky-circles, will have to be undertaken by someone who understands both megalithic science, zodiacs and year-circles. Guess who? The 1970s quest for a Preseli zodiac can now be understood to be more obviously aligned with the present archaeological hunt for the original bluestone circle in Preseli. It is a shiny modern extension to the traditional ‘bluestone myth’, courtesy of Hubert Thomas’s petrological report from 1923, that originally impelled Lewis Edwards and later researchers of earth mysteries to visit the ‘Prescelly landscape’, in search of a landscape zodiac. And this same report almost certainly provided the initial impetus for the current archaeological froth of activity in Preseli. From this short prologue a gambling man could reasonably predict that the Preseli bluestone myth may have a few more twists and turns left in the telling by the end of the twenty-first century. Despite the Preseli zodiac remaining understood having become essentially a dismissed modern myth, it has been possible to demonstrate in only a few paragraphs that this modern myth has roots nourished by much older beliefs, and contains mythical elements that may go way back into the prehistoric period. In effect the myth of the Preseli Zodiac and the tradition of the bluestone circle collide and may be one and the same thing. So here is the nub of the matter. Ancient traditions are rarely lacking in some core truth, however gaudy, evanescent and flimsy the wrapping paper may appear to suggest otherwise. Open up the package and this particular box is found to contain a tenacious legend about a sky-circle or zodiac or stone circle once built in the Preseli hills. Once the box has been opened up, the quest should then be to locate this hoary monument and try to work out who built it and why, and in so doing reveal its original purpose. It was identifying this task that originally impelled me to write Temple in the Hills, a project led me to the discover the original Stonehenge. If you want to purchase a copy of Temple of the Hills by Robin Heath, please send an email to mail@skyhenge.plus.com, with your name and shipping address, and whether or not you will want the book signed. This will be acknowledged and the options of payment methods made available. Currently, these are £10 inclusive of P&P, in the UK, £12 in EU and £15 in US. Other countries will require an appropriate shipping charge). The book contains over 80 original colour illustrations, including many of the Preseli landscape and its monuments.